Our most rewarding campaign involved raising national awareness about gum litter for the Chewing Gum Action Group, on behalf of Keep Britain Tidy and DEFRA. Did you know that 95% of all primary retail and commercial sites in England have gum staining? Now, that's something to "chew on"
Gum litter is a serious issue which is often overlooked and undertaken by many culprits from all walks of life. Did you know that 95% of all primary retail and commercial sites in England have gum staining. The Chewing Gum Action Group (CGAG) is a behaviour changing group, working hard on behalf of Keep Britain Tidy and DEFRA.Highlighting and fighting the issue of gum litter can be tricky because it requires national and regional focus and change. So, for the Chewing Gum Action Group awareness campaign, the real challenge was to raise national awareness around the issue of gum litter and to engage and inspire local groups to take their own action to positively reduce gum litter. Gum litter is such a huge and wide scale problem that we wanted our brand awareness campaign to achieve maximum news and impact as well as provide regional inspiration and initiative. So, we set about creating a high-profile, visual stunt to generate national interest and coverage, which could be replicated in the regions. 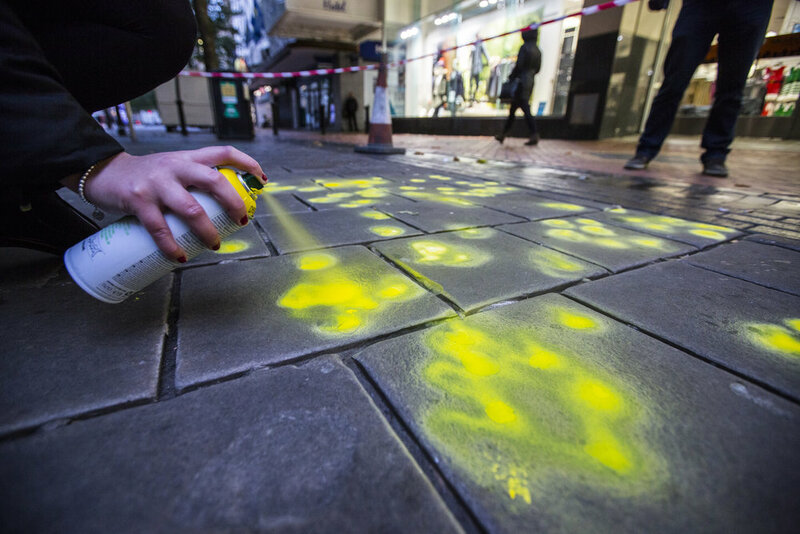 We fluorescent-chalk highlighted every piece of gum litter on Oxford Street, and video captured the stunt to engage national press and broadcasts. We worked in partnership with the regional BIDs and LAs to emulate the campaign. We created impactful photography and an impressive time-lapse campaign video, with filmed interviews, to provide creative legacy content for media and regional outreach. With 105 pieces of media coverage and 23 broadcast interviews, including Daybreak, The Guardian, The Huffington Post, BBC Breakfast News - regional, national and international audiences were well and truly reached. Our total campaign reach was 14,135,296 compared to previous year’s reach of 8,814,074, a 60% increase. Monitoring by New West End Company recorded a 44% reduction in gum litter following our campaign. The campaign represented a great return on investment because of its doubling effect in the regions and long-term impact as chalk-inspired campaigns are still being replicated in 2017.